These talented musicians from Illinois combined their professional experience to create TEN96. Band founder, Anthony Frank on guitar and back up vocals has performed with major entertainers throughout the country. 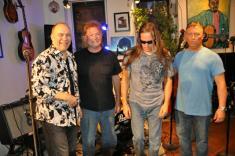 Dennis Hirschauer on lead vocals returned to Illinois after touring the European circuit. Mike Ray on drums plays with such and intensity and style that Anthony knew he was the right choice for TEN96. Each member has logged over 20,000 hours including studio, venues, study and tutoring, rendering them experts by music industry standards. While their main focus is Pop Rock, with original songs written by Anthony, their talents range from Metal to Jazz and even Blues. Come join Ranger Studios and CAU this coming Saturday, July 28th at Ranger Studios in Franklin Park and check out monster rockers TEN96 and Ignescent..